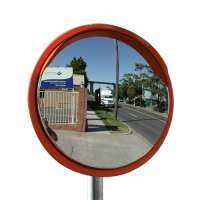 Outdoor Stainless Steel Traffic Safety Mirrors are robust and virtually unbreakable. The mirror face is made from highly polished, mirror quality, 18 gauge stainless steel and can resist damage from projectile objects such as rocks or vandalism. 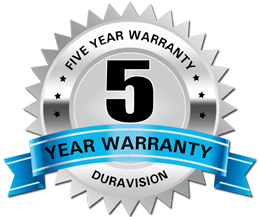 These outdoor convex mirrors can be installed where ever a driver's field of vision is blocked, such as driveways, blind corners on roads and highways and at hard to see intersections. The extra strong galvanised steel bracket is designed to mount to a 75mm pole. Ideal in vandal prone areas where graffiti can be easily removed. 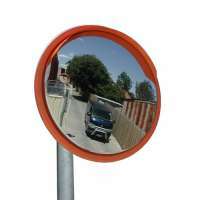 The 300mm Outdoor Stainless Steel Traffic Mirror are robust and virtually unbreakable. The mirror face is made from highly polished, mirror quality, 18 gauge stainless steel and can resist damage from projectile objects such as rocks or vandalism. This outdoor convex mirror can be installed where ev.. 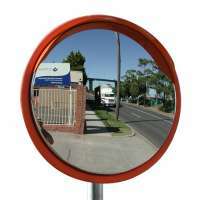 The 450mm Outdoor Stainless Steel Traffic Mirror are robust and virtually unbreakable. The mirror face is made from highly polished, mirror quality, 18 gauge stainless steel and can resist damage from projectile objects such as rocks or vandalism. This outdoor convex mirror can be installed where ev.. 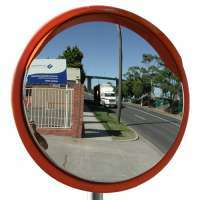 In Stock!The 600mm Outdoor Stainless Steel Traffic Mirror are robust and virtually unbreakable. The mirror face is made from highly polished, mirror quality, 18 gauge stainless steel and can resist damage from projectile objects such as rocks or vandalism. This outdoor convex mirror can be installed.. The 800mm Outdoor Stainless Steel Traffic Mirror are robust and virtually unbreakable. The mirror face is made from highly polished, mirror quality, 18 gauge stainless steel and can resist damage from projectile objects such as rocks or vandalism. This outdoor convex mirror can be installed where ev.. 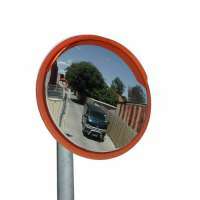 The 1000mm Outdoor Stainless Steel Traffic Mirror are robust and virtually unbreakable. The mirror face is made from highly polished, mirror quality, 18 gauge stainless steel and can resist damage from projectile objects such as rocks or vandalism. 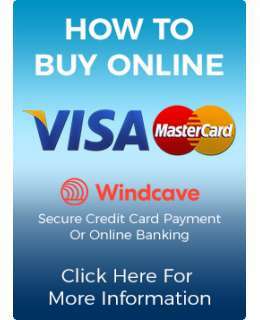 This outdoor convex mirror can be installed where e..